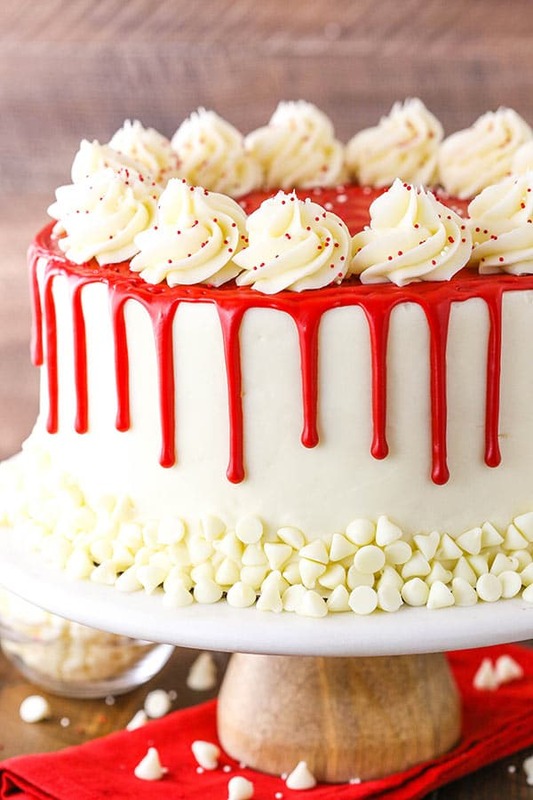 This Red Velvet Cheesecake Cake recipe has layers of moist red velvet cake and creamy cheesecake, covered in cream cheese frosting! 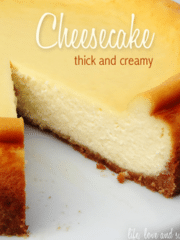 If you’ve ever had the cheesecake by the same name at The Cheesecake Factory and loved it, this is the perfect recipe to make at home! So by now you guys know that I love a good cheesecake. I have SO many on my site, it’s nutty. 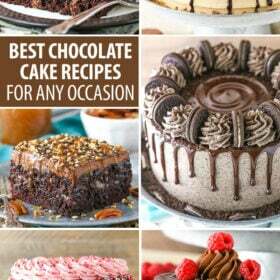 I’ve got other copycats from the Cheesecake Factory (or at least ones inspired by their cheesecakes), including the Banana Cream Cheesecake (my all-time fave), Oreo Dream Extreme Cheesecake, Kahlua Coffee Brownie Cheesecake and the Outrageous Chocolate Coconut Cheesecake Cake. 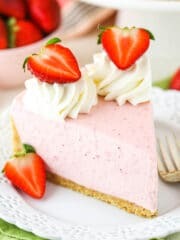 Add to that list the other cheesecake cakes I’ve got for you – like this Strawberry Cheesecake Cake and Carrot Cake Cheesecake Cake – and there’s a lot to get excited about! That said, this Red Velvet Cheesecake Cake quickly became a classic for us. So moist, so delicious and perfect for a special occasion or holiday like Valentine’s Day or Christmas. I’ve become a lover of red velvet cake since I started making it myself from scratch, so I personally LOVE the flavor of this cake. And it combines two amazing things – cake and cheesecake. Score! 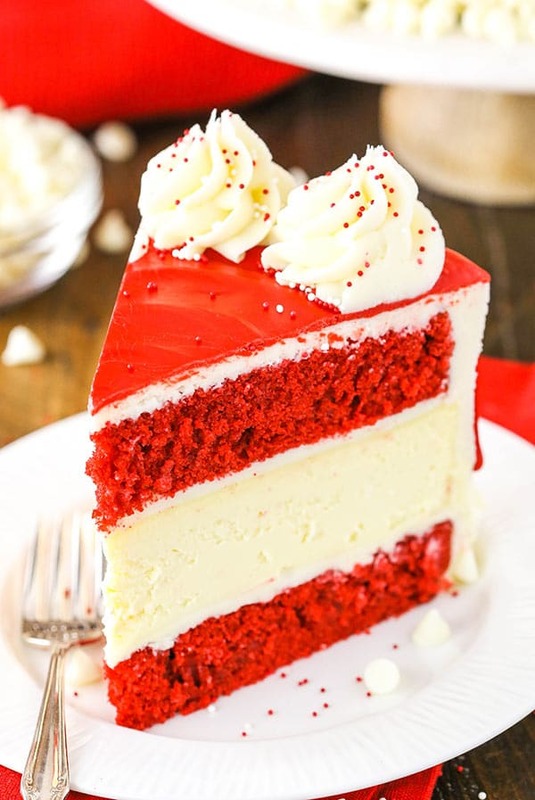 WHAT IS A RED VELVET CHEESECAKE CAKE? If the name doesn’t give it away, it’s a cake that’s layered with both cheesecake and cake. 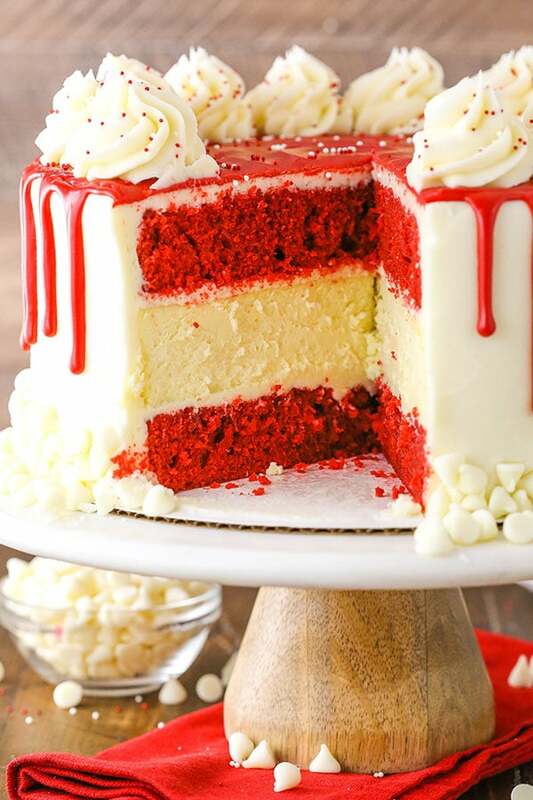 In this case, the cake layers are red velvet and the cheesecake is classic vanilla. As someone who genuinely enjoys red velvet, I do not think that red velvet cake is just chocolate cake. I feel like I see everywhere that it is, but let’s talk about how it isn’t, ok? 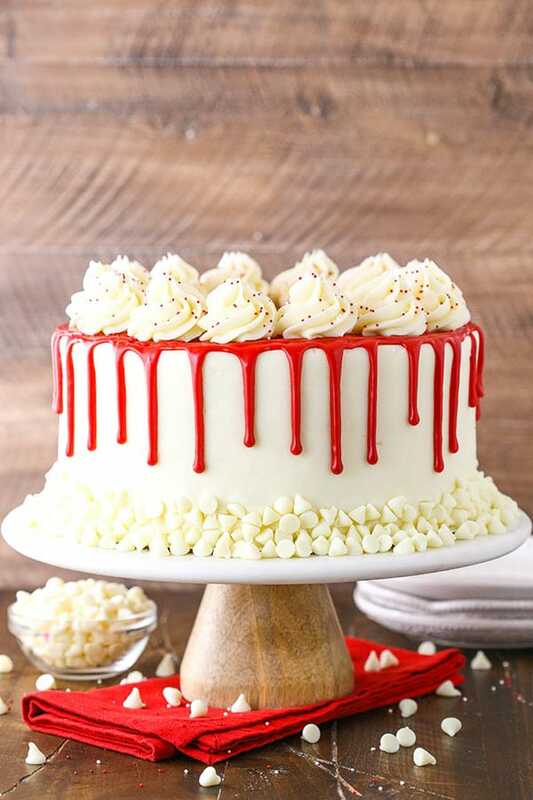 First, red velvet cake has always been made with vinegar and buttermilk and the acidity reacts with the cocoa to reveal the red anthocyanin in the cocoa, which would give it it’s red-ish color. These days, food coloring is added to really give it the red color we’re familiar with. These ingredients not only contribute to the color, but also the flavor. Red velvet cake has a lovely tang to it that simply isn’t present in chocolate cake. Second, and in my opinion this is the even bigger argument, chocolate cake has considerably more cocoa in it. If you look at my Best Moist Chocolate Cake, you’ll see it has three quarters cup of cocoa in it. This cake has 4 teaspoons of cocoa. So if we break that down, that’s 36 teaspoons in a chocolate cake versus 4 in this one. Just because Red Velvet Cake has cocoa in it, it doesn’t mean it tastes like chocolate cake. I’m telling you, if you made a chocolate cake with 4 teaspoons of cocoa and tried to pass it off as chocolate, people would call you on it. WHAT IS THE FLAVOR OF RED VELVET CAKE? 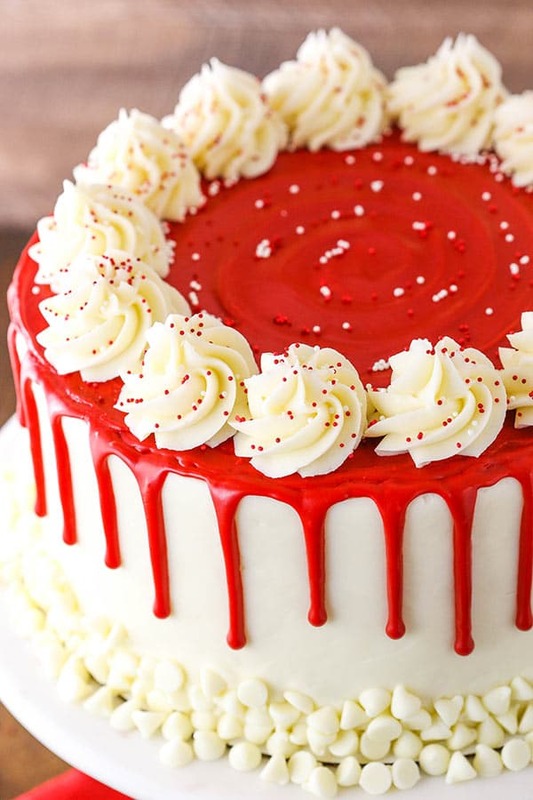 HOW DO YOU MAKE A RED VELVET CHEESECAKE CAKE? Now that we’ve covered the basics, let’s talk about how to make this delicious cake. Start by making the cheesecake. I use my classic, creamy vanilla cheesecake. One of the great things about this cake is that various parts can be made ahead and the cheesecake layer is definitely one of those things. Cheesecakes hold up well for several days, so making it a day or so ahead would be fine. As always, I bake it in a water bath. I know it’s a step that many go to great lengths to avoid, but it really does make a creamier cheesecake that doesn’t fall in the middle, brown on the edges or crack. 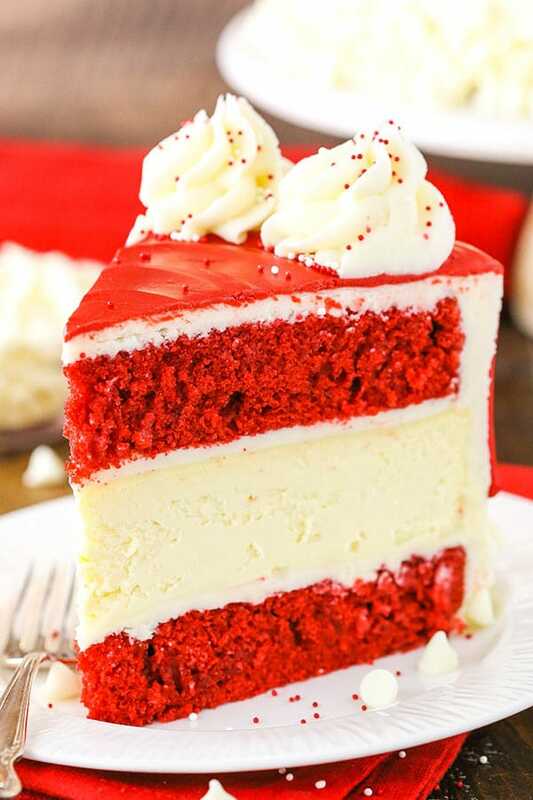 HOW DO YOU MAKE SURE THE CHEESECAKE LAYER IS THE SAME AS THE RED VELVET CAKES? The key to making the cheesecake for a cheesecake cake is to bake the cheesecake in same pan you’ll use for the cakes. This will ensure that the cheesecake layer is the same size as the cake layers and make it much easier to build and frost it later. So, even if you’re making a 9 inch cake (which this one is), and you tend to use a 9 inch springform pan for cheesecakes and then 9 inch cake pans for cakes, you’ll want to use the same cake pan for the cheesecake and cake layers this time. Not all 9 inch pans are actually the same size, so line your cake pan with aluminum foil and press it tightly against the sides. Then bake the cheesecake in that pan, let it cool and use the foil to lift it out of the cake pan. You can then put that cheesecake back in the fridge and use the cake pan for the cake layers. Once the cheesecake is made, it’s time for the cake layers. I used my favorite Red Velvet Cake recipe and it really is SO good! Bake up those layers and let them cool. When you’re ready to build the cake, make the Cream Cheese Frosting. It’s such a classic frosting to pair with red velvet and this one pipes and frosts beautifully. To build the cake, you’ll layer it much like you layer other cakes. Remove the domes from the tops of the cakes, then add the first cake layer to your serving plate. Add a layer of cream cheese frosting, then the cheesecake layer. You’ll add another layer of cream cheese frosting, then the final cake layer. Frost the outside of the cake as usual, then decorate it to your liking. 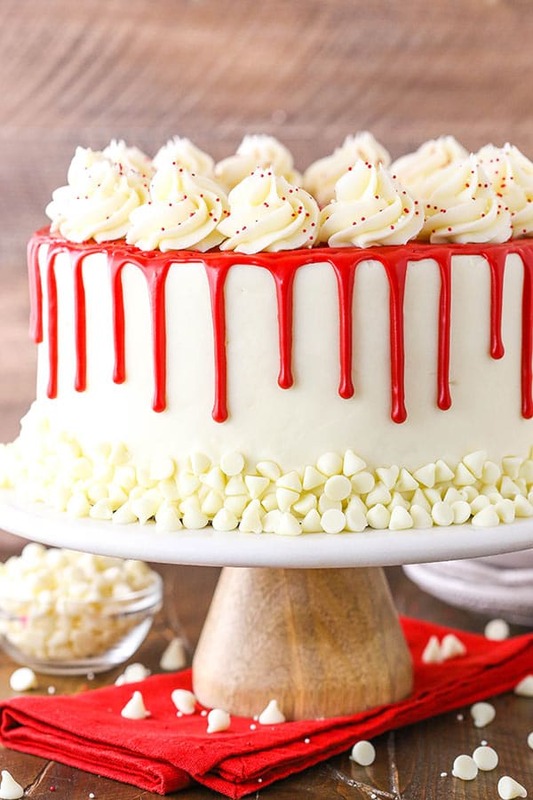 I decided to use a fun red drip, some sprinkles and some white chocolate chips, but you could also cover the sides entirely in white chocolate chips to keep it simple, but elegant. Totally your call. This Red Velvet Cheesecake Cake is made with layers of moist red velvet cake and thick and creamy cheesecake! If you’ve ever had the cheesecake by the same name at The Cheesecake Factory and loved it, this is the perfect recipe to make at home! 10. Preheat the oven to 350°F (176°C). Line the bottoms of two 9-inch (23cm) cake pans with parchment paper and grease the sides. 11. Add the flour, sugar, baking soda, baking powder, cocoa and salt to a large mixer bowl and combine. Set aside. 12. Add the buttermilk, vegetable oil, vanilla extract, eggs, vinegar and red food coloring to a medium sized bowl and combine. 13. Add the wet ingredients to the dry ingredients and beat until well combined. 14. Slowly add the hot water to the batter and mix on low speed until well combined. Scrape down the sides of the bowl as needed to make sure everything is well combined. 15. Divide the batter evenly between the two pans and bake for 23-26 minutes, or until a toothpick comes out with a few moist crumbs. 16. Remove the cakes from the oven and allow to cool for 3-5 minutes, then remove to a cooling rack to finish cooling. 17. When you’re ready to build the cake, make the frosting. Add the cream cheese and butter to a large mixer bowl and beat until smooth. 18. Slowly add about half of the powdered sugar and beat until well combined and smooth. 19. Add the vanilla extract and mix until well combined. 20. Slowly add the remaining powdered sugar and beat until well combined and smooth. 21. Use a large serrated knife to remove the domes from the top of the red velvet cakes. 22. Place the first layer of cake on a serving plate or a cardboard cake round. Spread about 1 cup of frosting evenly on top of the cake layer. 23. Use the aluminum foil to lift the cheesecake out of the cake pan, remove the foil and place the cheesecake on top of the cake. 24. Spread another cup of frosting evenly on top of the cheesecake, then add the second layer of cake on top. If the sides of the cake don’t line up, use a serrated knife to trim off the excess cake or cheesecake. 25. Frost the outside of the cake. Check out my tutorial for frosting a smooth cake, if you’d like. 26. Press white chocolate chips into the bottom of the cake, around the bottom edge. Refrigerate cake for about 20 minutes. 28. Heat the heavy whipping cream just until it begins to boil, then pour over the candy melts. Allow it to sit for about a minute, the whisk to melt. If it isn’t completely melted (and it probably won’t be), heat it for another 20-30 seconds, the whisk until smooth. 29. Allow the ganache to cool until it thickens up a good bit, but is still pourable, then transfer to a squeeze bottle. 30. Drizzle the ganache around the edge of the cake. 31. Heat the remaining ganache (you can leave it in the bottle) for about 10 seconds to soften it up again, then pour it onto the top of the cake and quickly spread to the edges. 32. Allow the ganache to cool and firm, then pipe swirls of the frosting around the top edge of the cake. I used the Ateco 844 icing tip. Add sprinkles, if desired. 33. Store the cake (in an airtight container, if possible) in the refrigerator until ready to serve. Cake is best for 2-3 days. I can’t wait to make this cake. I love all your recipe’s that I’ve tried so far. Thanks for sharing them. Looks stunning!! My question, what to do with the 3rd cake round baked? Why not just make 2 rounds? Also, I’m going to try the true traditional southern frosting, made with flour on this! Getting started in about 10 mis! I’m sorry, that’s an error. It is two cake layers. I’ll update the recipe ASAP. Thanks! Actually I just checked the recipe and it looks correct. Am I missing something somewhere? Step #15 refers to 3 cake pans…. Directions and pictures only show 2 layers of cake. Ohh, I see it. Step 10 was ok, and I’ve now fixed step 15. 🙂 Thanks! Hi – I’m from Georgia and have never made (or heard of) a frosting with flour. Can you share or point me in the right direction? I’d like to know more. it was a big hit. Thanks again! Lindsay, step 15 states to divide the batter between the three pans. I think maybe that is what she was talking about. Can’t wait to make this recipe! Just wondering what the hot water does – won’t it scramble the eggs? No, it won’t scramble the eggs. The eggs are mixed into the batter before the hot water, so it’s not an issue. The hot water temperature allows the cocoa to bloom and increases the flavor of the chocolate. You could use room temperature water if you wanted. Soooooo pretty! I’ve never actually tried red velvet before, and, to be honest, I never even really knew what it was before now! 🙂 Thank you for such a great recipe! All your recipes are always really great. Thank you! I’m glad you’ve enjoyed the blog and recipes! Hi Lindsay, the cake looks amazing! 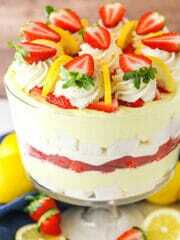 I will make this for Valentine to bring to a friends house as the dessert. 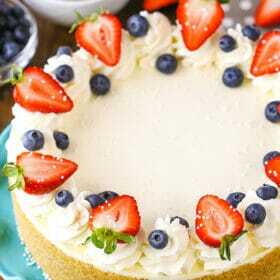 I have a question: I would like to cover this cake with fondant (white) can i still use the cheese cake layer? 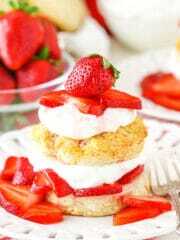 I will put cream cheese filling in between layers of cakes. As to for the icing I will have to make a buttercream frosting? before i cover with fondant? I haven’t worked with fondant that much, so I’m not sure. I’m sorry! I made the cake and decorated according to recipes. It turned out great! I’m going to slice it and share it with my neighbors. It does – you’re in luck! There’s a red button labeled “print” in the pink recipe card. Just hit that button and it brings up the printable version of the recipe. 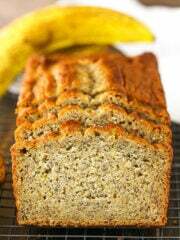 For your convenience, here is a link to the printable recipe card. When you reheat the chocolate melts, do you do it in the mocrowave or on the stove? You want to reheat it in the microwave for a just a few seconds – less than 10. 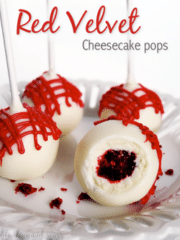 Can I add red food coloring to the candy melts since I don’t have anything but white? Not entirely sure where to buy colored candy melts. Red food coloring could be added, but you’d need a lot more to actually get a red color, which would thin out the ganache too much. Were the cake layers leveled so they were flat on top? Rounded cake layers can make it hard for things to stay put. Was your frosting thick enough? You didn’t mention an issue with it, so I’m assuming that was ok, but just checking. Other than that, it’s hard to say without being there to see what was going on or knowing more. Just a few questions for you. 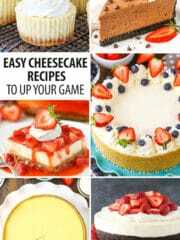 The total time for the recipe says 4 hours 26 minutes but on the cheesecake portion of this recipe, it says to bake for an hour, turn oven off and let sit for 30 minutes, then crack the over door and let sit for another 30 minutes, and the remove from oven and chill for 5 to 6 hours. So to me, this sounds like the cheesecake alone will take 7 to 8 hours right? If that’s the case, should I bake it the day before so it can sit overnight? And when you say chill do you mean in the refrigerator? Sorry for all the questions I’m new to baking ???? You are right – the times estimate “active time”. With the chilling time, I do suggest to make the cheesecake the day ahead, which is what I normally do. And yes – chill in the fridge. I hope you enjoy it! Has anyone made this in a springform pan? im wondering if water would leak into the bottom. i did line mine with aluminum foil and put it in water. you could see the water coming in under the foil but im wondering if it wont happen once the cheesecake is in it because it will have some weight? any thoughts would be appreciated. thank you! If your springform pan leaks, it’ll leak even with the cheesecake in it. It’s a common problem. Unfortunately, springform pans are really unreliable. Here’s a tutorial I have though for helping with that issue a bit. I hope it helps! Thank you! Would you still line the inside with foil as well? Or is the spray enough to keep the cheesecake from sticking without a crust? Spraying it well should be fine. The foil on the inside of the cake pan is really for lifting it out. If using a springform pan, the sides come off, so no need. Do you use salted or unsalted butter for icing? I use salted butter for the icing. Hi Lindsay, I made the red velvet cake, would like to know how long in advance could I frost it. Can i frost it 24 hrs before? Can I make the frosting & refrigerate for a few hours till ready to frost? You can, just keep in mind that the frosting will firm up in the fridge, so you’ll need to let it soften. Hello! I was wondering how can you tell the cheesecake is fully cooked? You want the edges to be set, but the center few inches to still be jiggly. The center continues to cook during the cooling process. 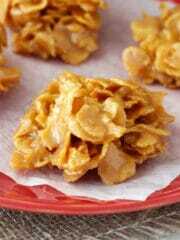 This is the first recipe of yours that I’ve tried. I loved the organization of the ingredients and baking instructions. I’ve never made any of the things in this recipe and I am quite satisfied with how it turned out! The red velvet is so good. I’ll definitely be checking out some of your other goodies! I also liked the smooth frosting tutorial— I’ll be using that in the future! Thank you! So glad you enjoyed the cake! I haven’t tried using 6 inch pans, I’m sorry! I’m guessing it would work if you cut the recipe in half, but I’m not totally sure. You would want to reduce baking times and keep an eye on it. You could try it! Yes, it should be. I tend to frost more generously than the average person (I think) and this covered the whole cake, piping included. Happy birthday! I hope you enjoy it! I made this last week and had PLENTY of frosting…even though I used a lot of frosting on the cake, I had so much left, I can use it on a sheet cake! But this cake was the hit of my garden club meeting. This recipe was amazing. I made it for Valentine’s Day. My only ask is, would you please share your tips for transferring the cheesecake layer from the foil to the cake? I had a really hard time with that step, even after several hours of refrigeration. Also, the crumb coat didn’t really want to stick to the cheesecake layer, which made icing the cake a bit challenging. Please share your tricks to making this cake so perfectly! I’m so glad you enjoyed it! As for transferring the cheesecake, I’m not sure I have any brilliant tips. The cheesecake should be pretty firm after refrigerating, making it relatively easy to handle. I just carefully remove the foil and immediately put it on the cake. As for frosting it, I use the large tip shown in this tutorial for fully frosting the outside, which makes it easier to add it to the sides of the cheesecake. I hope that helps! Just wondering the calorie and carb numbers? I’m not sure, but you could plug the recipe into a nutritional calendar. 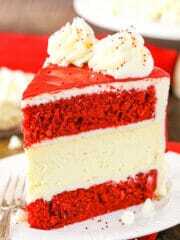 Who doesn’t like Red velvet cheese cake? Thanks for sharing the recipe without being selfish??? ?Just kidding..???? 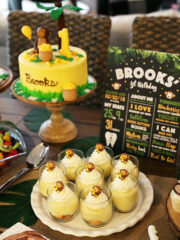 Hey I am wanting to make this cake for my son’s birthday. that week is going to be super busy so I was hoping to make the cake in advance and freeze it. Unsolved the day before. Would this cake be okay to do that? I haven’t ever frozen a cake like this whole, so not totally sure. I *think* it’d be ok.
Sorry！ I couldn’t find the recipe in the above article? No links and no amount for each ingredients!!! WHERE IS IT? Hello, i would love to try this recipe however wanted to know if you can recommend a brand for the vinegar please? Im based in the UK and white vinegar is not something that is readily sold here. Would cider vinegar work? or spirit vinegar? I’d try using a milk vinegar that you have. Cider vinegar would probably be fine. My red velvet cakes have not risen, 1/2 spoon of baking powder is really enough? Help me ???? I’m not sure what happened, but yes 1/2 tsp is correct. I made this cake and it tasted great. The recipe needs to sat that you need 3 cake pans. I had a lot of things go wrong. First I bought light cream cheese. 2nd I forgot to set the timer. 3rd when I went to assemble the cake and I cut the top off one of the cakes weren’t done in the middle so I put it back in the oven. I should of just cut that part off. I couldn’t get the sides smooth. The biggest thing it took me 10 hours to make. That is way to long. If you make it make the cheese cake the day before. It did taste good! I actually attempted to make this cake over the weekend and something went wrong it turned out flat. How long do you suppose to mix it? It’s really difficult to say without being there to see what was done. Did the layers collapse, or are they just flat? They may be fine. If they collapsed, I’d check the baking soda and powder to make sure they’re ok and that you added the correct amount. Hey Lindsay , this cake looks amazing and I can’t wait to make it. For the red velvet mixture, when folding in the hot water, does it have to be boiling? No it doesn’t have to be boiling – just hot/warm. I want to make this cake for my suns bday but he doesn’t really like cream cheese icing. Looking into Italian meringue icing fro top and sides (not buttercream…) would this work inside the cake too to keep the layers together? Also, Can i bake the cake layers ahead and freeze? It’s only 3-4 days ahead, but still that would help. The meringue would work. You could also use whipped cream, which I’ve done on other cheesecake cakes. Oh and yes, you could make the layers ahead and freeze. Just wrap them well and thaw in the fridge. Hmm, did you by chance reduce the powdered sugar at all? The frosting really relies on that to thicken up. For some additional help with cream cheese frosting, try checking out my post on it. Also, my post on frosting consistency. Made this cake for a baby shower Mom-to-be faves are red velvet & cheesecake) – used pink candy melts for the drips (it’s a girl) … it was a huge hit and tasted fabulous. I will be visiting often for more recipes!! 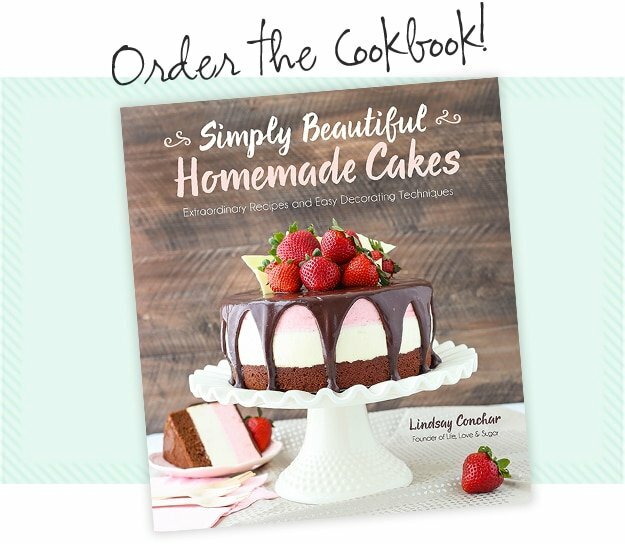 Hey Lindsay, this cake looks amazing and I cannot wait to make it. I have two questions for you. When i am making the red velvet cake mixture, does the hot water need to boiling? Also i was wondering do you have an idea on how tall this cake is? I am just wondering because I am traveling with it and need a cake carrier, and what to make sure the dimensions are correct. Not necessarily boiling, just hot. As for height, it’s fairly tall (and heavy). I’d say probably around 5 inches – give or take. Thank you LIndsay. I thought my first comment did not go through, so i sent out a second one. Sorry for making you respond twice. I will attempt to give this cake a Easter decoration for this weekend. I cannot wait to taste this cake. I have never really had a red velvet cake before.